MWC brought us many things, from sleek see through mobiles, to those that incorporated 12 megapixels into a fully touch screen shell. But amongst the selection of high end devices there also existed those that catered to the slightly less techie market. I’m talking your Grandparents generation, who desire a phone that’s simply a phone, with large keys and high volume being prioritized over newfangled ideas such as WAP and 3G. 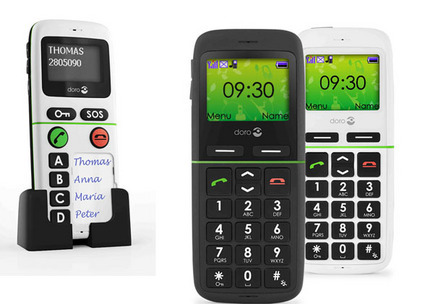 Doro have launched 5 handsets that pride themselves in their simplicity, as they feature large easy to read displays and extra large buttons. 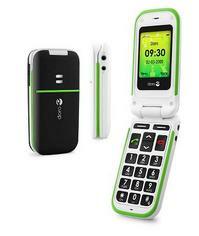 They’ve released their first ever clamshell phone, the jazzily titled PhoneEasy 410gsm. It comes with integrated Bluetooth and a necklace cord so you can keep it on you at all times. They’ve also given us the Doro HandlePlus 334gsm, which is a mobile that comes equipped with an emergency button, should the worst happen. It’s really easy to set up and you have the option to programme in four separate numbers into buttons on the large handset, so you’ll never get confused as to what button to press. Naturally you can send SMS, make and receive calls and possibly even play Snakes (though that’s not confirmed), but the idea really is making sure dear old Gran is accessible despite her suspicion of modern technology. There’s also the 338gsm, 342gsm, 345gsm which are more basic versions of the above models.. This is the first time that I’ve learned about Doro phones for seniors. These phones look cool. But I hope they are truly reliable, too. Sometimes, businessmen are just trying to lure buyers by using attractive looks and promising features. Then in the end, they will only give disappointments to their consumers. I am able to say this because I’ve experienced this when I purchased one of the most promising phones for seniors in the market, Jitterbug. It caused me total disappointment, really! So far, the sole phone for seniors that I’ve proven true to its promises is the Just5 phone. This never gave me a headache and disappointment. I’m really satisfied with this. I hope Doro will match to the level of fulfillment that Just5 phone is able to provide to their consumers. If so, they will certainly win the trust of many, just like my trusted Just5.